Poker Texas hold 'em (also hold'em, holdem) is the most popular poker game in the casinos and poker card rooms across North America, Europe and online. Hold 'em is a community card game where each player may use any combination of the five community cards and the player's own two hole cards to make a poker hand, in contrast to poker variants like stud or draw where each player holds a separate individual hand. After slow but steady gains in popularity throughout the 20th century, hold 'em's popularity surged in the 2000s due to exposure on television, on the Internet and in popular literature. During this time hold 'em replaced 7 card stud as the most common game in U.S. casinos, almost totally eclipsing the once popular game. The no-limit betting form is used in the widely televised main event of the World Series of Poker (WSOP) and the World Poker Tour (WPT). Hold 'em's simplicity and popularity have inspired a wide variety of strategy books which provide recommendations for proper play. Most of these books recommend a strategy that involves playing relatively few hands but betting and raising often with the hands one plays. To win an online poker match, you can't play by instinct: try following these basic online poker strategy. Play poker online and other games for free. 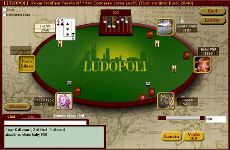 Enter Ludopoli the games city and find new friends!